What's the process to link my Strava account ? Connecting your account with Strava allows for automatic fetching of activities and filling of the calendar, leaving just the analysis part for 3record. 3record only has a read access to your Strava account via an authorization token. It has no access to your Strava password and cannot add, modify or delete anything on your Strava account. The access token can be revoked at any time via the member panel. For all activities on Strava, 3record will import summary data and streams such as speed, duration, distance or map. It tries then to merge them with the manually entered value or simply creates a new activity if there is no match. Data on Strava is not modified in any way. The script at strava/import_after takes by default a defined number of activities after the last one that was imported. If you have more to import, you can simply refresh the page until all the activities have been imported. 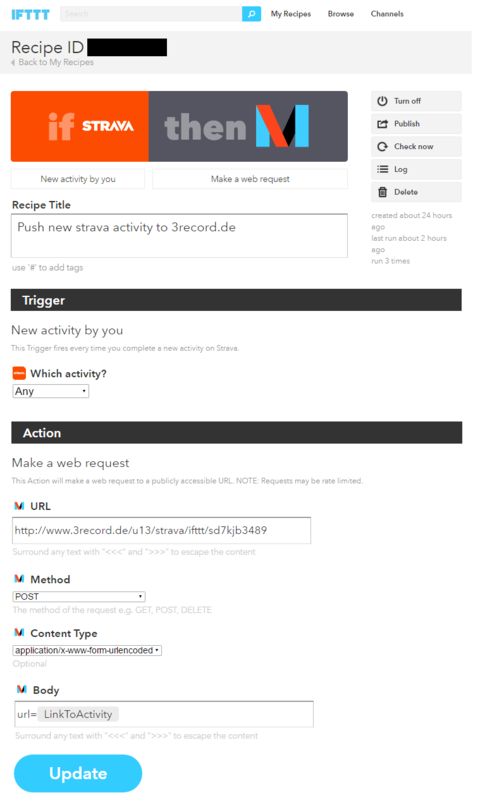 Importing older activities can be performed by specifying a timestamp in the URL https://3record.de/strava/import_after/<timestamp> where <timestamp> is the unix timestamp (see http://www.timestamp.fr, 24 hours ago for instance would be 1555507091). Calling the page with a recent one might be required then to reset the timestamp register and not go through each activity from there up to today. Go to the member panel and, in the section related to strava, click on link account. You will be redirected to the strava website and will be required to authorize 3record to access your data. Note that this access can be removed afterwards in the member panel as well (please don't remove it on strava only). Go to https://3record.de/member/ifttt_token and define a personal IFTTT token. Log in to https://ifttt.com and create a new recipe. On trigger ("this") choose the Strava channel and the New activity by you trigger (with Any type). Starting from now, new activities should automatically be uploaded from Strava to 3record (except "indoor rides" due to Strava not pushing them to IFTTT; they must therefore still be imported manually).